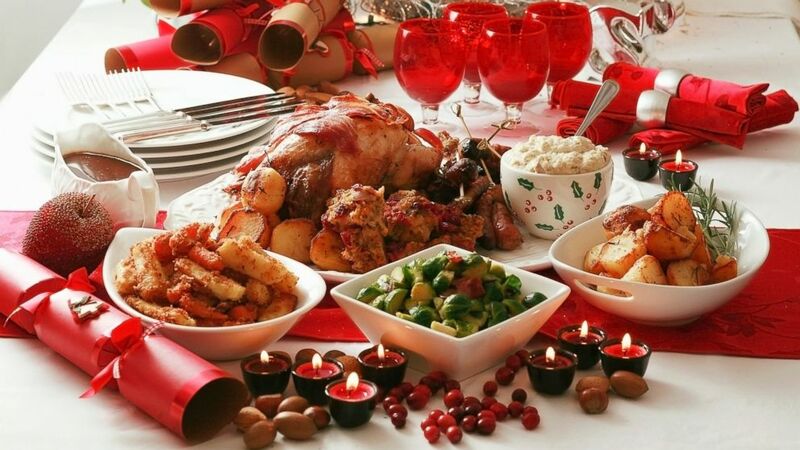 What dishes to choose for the Christmas menu? Usually, the hosts start thinking about this question immediately after the end of the New Year celebration. If this year the responsibility for the Christmas menu fell on your shoulders, this article will gladly help you to lay a delicious, hearty table for the joy of family and friends, making the holiday enjoyable, bright and memorable. First of all, of course, you should decide on a hot one - will it be one signature dish or several, a classic or a fascinating culinary experiment? If a large number of people gather at the festive table, it will be more convenient to prepare one large dish for all than to spend time on portioned dishes for each guest. For example, Christmas meat with sauerkraut and potatoes. It is also much more practical to bake a large piece of meat, then to cut it in portions, than to cook a large number of chops. So, a 4-pound piece of meat will be enough for 12 people. All you need is to marinate it well, fill it if you wish, coat it with glaze and put it to the oven. You should admit that it is a child`s play. Turkey roll with bacon, "New Year's Feast" meat in the oven or oven-baked boiled pork - an excellent proof of this. If you decide to bake poultry, then a 5-pound chicken or turkey is quite enough to feed eight people. Stuff it with prunes with walnuts and decorate with caramelized apples, oranges, and greens - this fantastically beautiful and incredibly tasty dish will lead your guests to indescribable delight. Baked chicken with potatoes and rosemary, "Surprise" stuffed chicken or duck with potatoes will look very festive on the table. Seafood lovers will surely appreciate the stuffed pike or baked fish rolls with vegetables. Of course, every family has culinary traditions maintained for many years, but a holiday is an abundance and a riot of tastes, vivid emotions, and impressions, which means the best time to venture on culinary experiments and try gastronomic delights. Do not be afraid to combine traditional dishes with new and unusual - for example, exotic appetizers and salads will complement the classic hot dish. Besides, the same classic can be served in the original version, completing it with a variety of ingredients, for example, to cook meat baked with pineapples or chicken kiwi chops with cheese. Christmas is a great occasion to make salads and snacks that you wanted but could not make for the New Year. And now you can slowly and without fuss do the dishes, the embodiment of which you had to postpone, as well as devote more time to decorating plates. Christmas potato salad, Bright Holiday salad, Stargazer layered salad, and Tsarsky salad will perfectly fit into the Christmas menu thanks to the excellent taste and festive appearance. At Christmas, you can also dream up with traditional New Year salads, presenting them in a new version. For example, your guests will be pleasantly surprised if you give them Russian salad with salmon or salt herring salad. Snacks can be approached no less creatively by preparing Christmas wreath canapés, stuffed with crab sticks or “Fungal pieces". The most straightforward options for meals are tartlets, the filling of which can be the most diverse, and stuffed eggs. Their preparation usually does not take much time. If you want to give these traditional snacks a touch of originality, make tartlets with crabmeat pies or eggs stuffed with herring. The Christmas menu, perhaps, especially needs a sweet dessert, since the table for Christmas is usually not as lush as on the New Year, which means that by the end of the meal guests still have a little room for something tasty in the stomach. Therefore, traditional gingerbread, orange cake, Christmas cinnamon buns or the “Yule log" cake will fall in handy here. Each holiday has its taste, and at New Year's holidays it is, above all, the flavor of fragrant spices, so be sure to shade your desserts with cinnamon, ginger, cardamom or cloves. Also, add a festive touch of sweet dishes will help orange peel. Do not want to bother with baking? No problem! Beautifully decorated fruit plate, berry jelly, soft mousse, baked apples with dried apricots and nuts or hand-made truffles will also be an excellent final note in the Christmas menu. In winter, more than ever, you want warmth and comfort, which is why warming spicy drinks are particularly topical on the menu. It can be mulled wine with lemon, honey grog or Christmas cacao with cream. It is better to exclude strong alcoholic drinks altogether and serve champagne, wines, liqueurs and homemade cocktails instead. Christmas menu is another way to give your loved ones a tasty holiday, wrapping them with care and warmth of home comfort. Bon appetite and unlimited happiness in the coming year! About the author: Melisa Marzett loves Christmas more than any other holidays. She is a freelance writer and her current place of work is http://livecustomwriting.com/. She is active and available on social networks. Feel free to contact her and read much more recipes for Christmas and New Year's dishes on her pages.